LG and Samsung have long been considered rivals in the mobile industry. Despite both companies putting out some of the best phones on the market, LG has been unable to get out from under Samsung’s shadow. 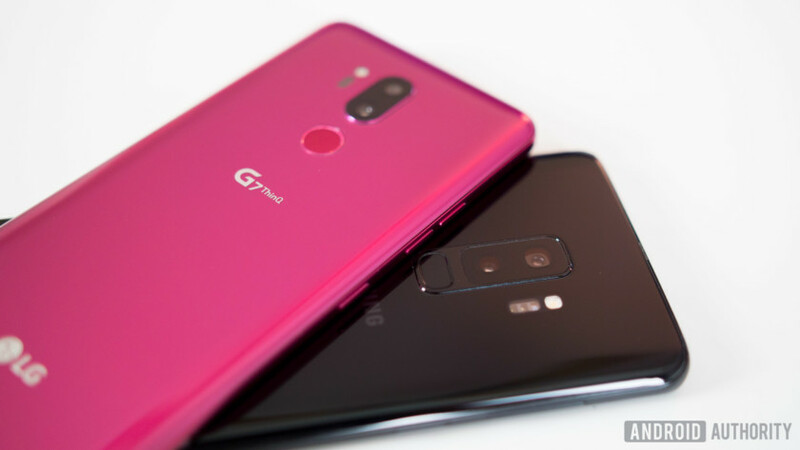 The LG G7 ThinQ may not be able to change that, but it’s always fun to compare these two companies’ respective flagships to see how they fare. Let’s take a closer look at how Samsung and LG’s latest flagships compare in this LG G7 vs Samsung Galaxy S9 Plus comparison. The heavy use of glass does mean that keeping the devices free of fingerprints is a nearly impossible task but the designs are quite elegant and sleek. In the design department, the LG G7 and Samsung Galaxy S9 couldn’t have a more similar look and feel. They are both constructed with glass front and rear panels and a smooth metal frame, with curves all around. The heavy use of glass means keeping the devices free of fingerprints is nearly impossible, but the designs are elegant and quite sleek. LG and Samsung make some of the most premium devices on the market so it’s no surprise their phones are comfortable to use and have fantastic build quality. The LG G7 is more manageable than the Samsung Galaxy S9 Plus in one hand, with a size more like the standard Galaxy S9. Placement of buttons, ports, and other hardware like the camera and fingerprint sensor are practically identical across both devices, which wasn’t always the case. The cameras are centered vertically on the rear with the fingerprint sensor underneath where it’s comfortable to reach. The power and volume buttons are on the left and right sides and ports like the 3.5 mm headphone jack, USB type-C port, and speaker occupy the bottom. This year LG added a dedicated hardware AI button below the volume buttons of the G7, just like the Bixby key on the S9. The only difference here is that LG’s AI of choice is Google Assistant which is arguably the better choice. These dedicated virtual assistant buttons can’t be remapped on either device, though LG is considering changing the option for the future. Both displays are capable of reaching 1,000 nits of brightness allowing them to be easily seen in direct sunlight and are HDR ready. 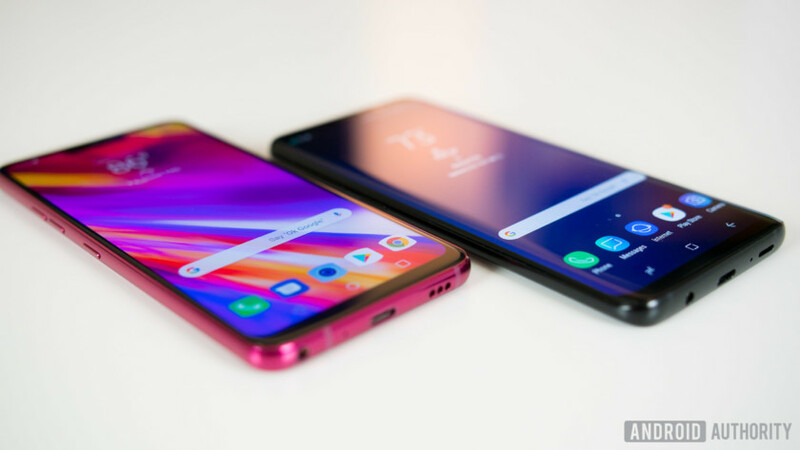 The LG G7 and Samsung Galaxy S9 both feature near edge-to-edge displays with thin bezels, but where they differ is in the screen technology and LG’s use of a notch. The G7 has a 6.1-inch QHD IPS LCD display, whereas the Galaxy S9 and S9 Plus feature the QHD Super AMOLED panels Samsung is known for. Samsung’s smartphone displays are some of the best on the market and the S9 continues to push that forward. The G7’s IPS LCD is one of the best LCDs you’ll find on a smartphone. It’s vibrant, colorful, and full of contrast. Due to the nature of AMOLED Samsung’s display still wins in black levels, though the G7 puts out some impressive results for an LCD. Both displays are capable of reaching 1,000 nits of brightness, allowing for easy direct sunlight viewing, and making them HDR ready. The LG G7’s notch may not be to everyone’s tastes but it isn’t as bothersome as it seems. Samsung chose not to take part in this trend with the S9, so if you truly hate notches the Samsung S9 is one of the best flagship options around. The HTC U12 Plus also just broke cover and is also blessedly notch-free. Inside, the LG G7 and Samsung Galaxy S9 feature the same specifications, with the latest Snapdragon 845 processor from Qualcomm and 4 or 6GB of RAM. With Samsung how much RAM you get will depend on whether you opt for the S9 or the S9 Plus, whereas the RAM on the G7 is storage-dependent. As expected, the G7 and S9 are very fast phones and perform similarly in real-world usage. They handle browsing the web, social media, gaming, and other typical smartphone tasks very well, with excellent responsiveness and fluidity. I never ran into issues with lag or dropped frames on either device regardless of what I threw at them. The LG G7 and Galaxy S9 are easy to top up as they feature Qualcomm's Quick Charge and have the added convenience of wireless charging. Battery life performance is comparable between the G7 and standard S9 as they both feature 3,000mAh batteries. Both the G7 and S9 can get through a full day of use, but screen-on time numbers are average at best. The S9 Plus provides the best battery life — no surprise, considering its larger 3,500mAh cell. However, the LG G7 and both Galaxy S9 variants feature Qualcomm’s Quick Charge and have the added convenience of wireless charging, so they’re easy to top up. Where LG continues to outshine Samsung is with the audio experience. LG continues to keep up very well with Samsung in the hardware department. In some cases it’s actually superior. The LG G7 and Samsung Galaxy S9 are both IP68 certified against water and dust and have microSD card slots for extra storage. Where LG continues to outshine Samsung is with the audio experience. The LG G7 has LG’s signature quad DAC that delivers fantastic audio when paired with a good pair of headphones and the phone’s single bottom-firing speaker is impressively loud. LG’s clever use of the phone’s internal space as a resonance chamber has improved the speaker experience dramatically. The dual speakers on the Samsung Galaxy S9 offer stereo sound, which the G7 can’t do, and the addition of Dolby Atmos is great, but the phone’s offering still pales in comparison to the overall audio experience LG delivers. This is probably one of the most crucial parts of our LG G7 vs Samsung Galaxy S9 Plus comparison. With the LG G7 and Galaxy S9 it boils down to whether you want a wide angle or telephoto zoom lens for your second camera. To keep the camera comparison fair we’ll be looking solely at the S9 Plus for this section, as it’s the only S9 model with dual cameras. The LG G7 features two 16MP cameras with a f/1.6 aperture and OIS on the main lens and a f/1.9 aperture on the wide angle. On the Galaxy S9 Plus you get two 12MP cameras with Samsung’s super fast dual-pixel autofocus and optical image stabilization on both lenses. The telephoto lens is not the greatest in low light at f/2.4 aperture but it provides 2X optical zoom without any loss in detail. The biggest drawing point to the Galaxy S9’s camera is Samsung’s implementation of a mechanical aperture. The camera can physically change between f/1.5 and f/2.4. You can set it to do this automatically, based on lighting conditions, or control it manually. This is something we usually only see in DLSRs or bigger more complex cameras. Samsung bringing the technology to smartphones is truly groundbreaking, even if the benefits of the tech are only going to felt under very specific circumstances. LG has toned down its wide angle lens this year by reducing the field of view to 107 degrees, but it’s still one of the few smartphones on the market to offer a quality wide-angle experience. The reduction in field of view fixes the distortion along the edges of photos which is a small price to pay and it’s still plenty wide enough for breathtaking landscapes and group photos. Both cameras are packed to the gills with features too. The LG G7 and Samsung Galaxy S9 both come with portrait mode and AI camera features. The S9 also offers AR emojis for creating cartoon versions of yourself and others if you’re into that kind of thing. Portrait mode on the LG G7 is a first for LG and works on the front and rear cameras. LG has also bumped up the resolution of their front-facing camera to 8MP which provides selfies on par with the Galaxy S9. LG and Samsung historically have topped the list of the best Android smartphone cameras and this year is no exception. Both phones take incredible photos. They perform well in low light, though there are notable differences when comparing the photos side by side. Samsung’s colors aren’t as saturated as LG’s and dynamic range is much better on the Galaxy S9 especially in dark shadowy areas. Both cameras capture great low light shots with very little noise thanks to their wide apertures and OIS but Samsung still outperforms LG. The G7 struggles with white balance and tends to produce overly warm images with softer details. These differences will matter to some, but most casual consumers will be plenty happy with either camera. The deciding factors here are the extra camera features and whether you want a wide or telephoto lens. LG is a couple steps behind Samsung in image quality, but I’d still take LG’s camera for the wide angle camera alone. I find it to be useful in many more situations than Samsung’s telephoto and it’s much more fun to use. If you've used Samsung's UI, you'll easily find your way around LG's and vice versa. The LG G7 and Samsung Galaxy S9 both run Android 8.0 Oreo, each with their own respective software skins. For the most part, LG and Samsung’s software is interchangeable. If you’ve used Samsung’s UI, you’ll easily find your way around LG’s and vice versa. There are some cosmetic differences, but overall they look and feel very similar and share many of the same features and gestures. They both feature always-on displays, a theme engine for customizing the UI, a gaming mode, and face unlock. There are software features that you won’t find across both devices and some could potentially sway your purchasing decision. The Galaxy S9 and S9 Plus offer Samsung Pay, a secure folder for keeping information private, and iris scanning for additional security. The LG G7’s more unique features aren’t quite as exciting but offer plenty of extra utility. You have LG’s signature KnockON to wake or sleep the display by double tapping, context awareness for automating basic tasks, and the floating bar allows for quick access to shortcuts with a simple swipe. So who wins this LG versus Samsung battle? We know Samsung is already the clear sales winner and will dominate LG in that field, but my pick goes to the LG G7 ThinQ. Although the experiences between both devices are very similar, the G7 does a few things better. Despite Samsung’s improvements to the speakers and its addition of Dolby Atmos, the Quad DAC of the G7 just can’t be beat. As I mentioned earlier, I also prefer LG’s camera experience for the wide angle lens. Last but not least, LG’s implementation of a hardware AI key with Google Assistant is more useful to me than Samsung’s Bixby. Very rarely do I prefer LG’s flagship over Samsung’s, but the LG G7 ThinQ makes improvements in all the right areas to make it the more compelling device for me this year. So that’s it for our LG G7 vs Samsung Galaxy S9 Plus comparison. What do you think of our rundown? Which phone would you pick? Sound off in the comments!